The survey also saw a slight uptick in support for President Donald Trump among Wisconsin voters and a larger jump in support for Vermont U.S. Sen. Bernie Sanders in the crowded Democratic presidential primary. Marquette interviewed 800 registered voters from April 3 to April 7. The margin of error for the entire survey was plus or minus 4 percentage points. Questions about Democratic presidential candidates and state issues had margins of error of about 5.6 percent and 5.7 percent respectively. It was Marquette's second survey since Evers became governor. During the first one in late January, 38 percent said they didn't know enough about Evers to say whether they approved of the job he was doing as governor. This time, that undecided figure was down considerably to 15 percent. Evers' job approval increased to 47 percent in April, up from 39 percent in January. His disapproval also went up, hitting 37 percent in April, up from 22 percent in January. "Partisanship is working its way," said Marquette University pollster Charles Franklin, noting that many of the "don't know" respondents from January were Republicans and some were independents. At the same time, a bipartisan mix of voters supported key elements of Evers' budget, including his plans to legalize medical marijuana, raise the minimum wage, accept federal funding to expand Medicaid, and increase state funding for special education. Marquette found 83 percent believe marijuana should be legal for medical purposes if prescribed by a doctor, a provision included in Evers' budget. The survey also found 56 percent of registered voters favored the full legalization of marijuana. Evers' budget would decriminalize possession of 25 grams of marijuana or less. It also found 74 percent support a "major increase" in special education. Evers' budget would increase state funding for special education by $606 million. The survey found 70 percent in favor of Evers' plan to accept federal funds to expand Medicaid. Meanwhile, 57 percent were in favor of increasing the minimum wage, which is also in the governor's budget. But the public opposed two other major Evers proposals. When it comes to transportation funding, 57 percent said they favored keeping gas taxes and vehicle registration fees at their current levels. Evers' budget would increase the gas tax by 9.6 cents per gallon over the next two years and clear the way for automatic increases in future budgets by tying it to inflation. Evers' budget would also freeze enrollment in publicly funded private voucher schools. Just 41 percent said they favored that move, compared to 46 percent who said they opposed it. The first three months of Evers' term as governor have been marked by a sometimes combative relationship with Republican legislative leaders, with both sides arguing the other is to blame for a lack of bipartisanship. Marquette's survey found Evers has been winning that public relations battle, at least so far. A total of 48 percent said Evers is trying to cooperate with legislative leaders while 37 percent said he isn't interested in cooperating. Meanwhile, just 25 percent said legislative leaders are trying to cooperate with Evers, while 57 percent said they're not interested in cooperating. As Evers' approval rating increased in the latest Marquette Poll, so did President Trump's. "He's a little bit better off than he was in January," said Franklin. In January, 44 percent said they approved of the job Trump was doing in office compared to 52 percent who disapproved. In April, 46 percent approved of Trump compared to 52 percent who disapproved. Similarly, in January, 39 percent said they were "definitely" or "probably" going to vote for Trump. In April, that number was up to 42 percent. 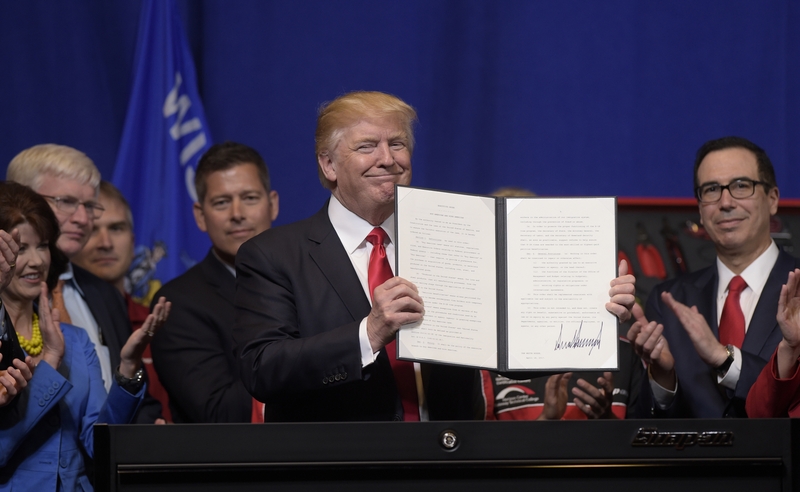 When it came to key questions about the Trump presidency, including the probe of his campaign by former FBI director Robert Mueller, Marquette's numbers sent mixed signals. Among those surveyed, 60 percent think Russia interfered with the 2016 presidential election, but just 35 percent think Trump colluded with Russia. And despite a slight Republican lean to Marquette's April survey sample, just 39 percent said the Mueller probe had cleared Trump of wrongdoing. Still, only 29 percent said they supported holding hearings on impeaching Trump, which was down from 33 percent in January. Franklin stressed it's early to read too much into polling for Wisconsin's presidential primary, saying candidates with established name recognition are likely to lead a crowded Democratic field at this stage in the campaign. But at the same time, Marquette's poll found a reshuffling of the Democratic front-runners, with Sanders jumping to the top. Among Democratic voters, 32 percent listed Sanders as their "top choice," followed by former Vice President Joe Biden at 29 percent and Massachusetts U.S. Sen. Elizabeth Warren at 17 percent. In January, Biden led with 32 percent, followed by Sanders at 23 percent and Warren at 15 percent. Rounding out Marquette's April poll were California U.S. Sen. Kamala Harris at 11 percent, former Texas U.S. Rep. Beto O'Rourke at 10 percent, New Jersey U.S. Sen Cory Booker at 9 percent, Minnesota U.S. Sen. Amy Klobuchar at 8 percent, South Bend, Indiana Mayor Pete Buttigieg at 7 percent, former U.S. Secretary of Housing and Urban Development Julian Castro at 4 percent, Washington Gov. Jay Inslee at 2 percent, New York U.S. Sen. Kirsten Gillibrand at 2 percent and former Colorado Gov. John Hickenlooper at 1 percent. "The point of doing this is to watch how the election evolves," Franklin said. "The point is not that any of these numbers tell us what's going to happen." Wisconsin's presidential primary will be held next April. 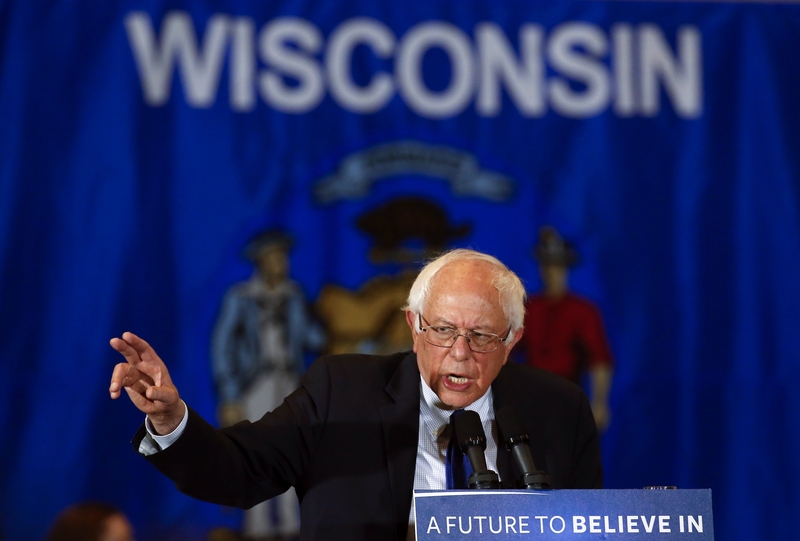 Sanders won Wisconsin's 2016 Democratic presidential primary.